Tan quotes Nishith Arora, chairman of MPS Limited, who notes that in publishing, copyediting is often outsourced to the English-speaking countries like India. […] Today, the absence of copyediting, design, typesetting, and above all, editing, means that will be one seriously amateur-hour book. One could argue that not only does raising revenue balance the equation as well, it makes for a more likely survival of the entity in question. When the price of oil rises, for instance, Exxon Mobil doesn’t dilute its gasoline with water; it raises the price of its product to a level that covers costs *and* allows for a healthy net. 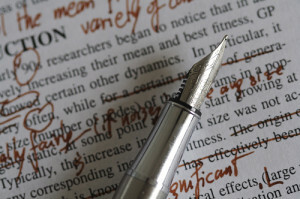 We’ve written several times about the virtues of copyediting. Basically, if you produce content, even if it’s online-only, you need a copyeditor. A spell-checker isn’t enough. Everyone is cutting corners these days, so your copyeditor can also multitask. For example, at SixEstate, I also blog, and I optimize the posts I edit. Today, any writer who does not make use of electronic spell-checking to detect misspellings, typos, and inconsistencies in proper names is a fool. And any writer who is not aware of the limitations of spell-check is doubly a fool. Just like every other part of the publishing process, copyediting has come a long way, evolving with the times. At SixEstate, we mostly adhere to the AP style, but we’ve also strayed from it from time to time, to keep up with the modern use of language, when we’ve felt that AP wasn’t quick enough to change its rules. Sometimes, I Google the word or phrase in question, and the version with the most entries wins. Don’t let someone misusing a word ruin your day. These ideas of rules came about in the 19th Century, when there were rich people who wanted to know how to talk better and other people who decided they wanted to make money teaching them. Clarity, consistency, flexibility — these three aspects are important to today’s copyeditor. Beyond that, there’s always Google. Image by Nic’s events (Nic McPhee), used under its Creative Commons license.